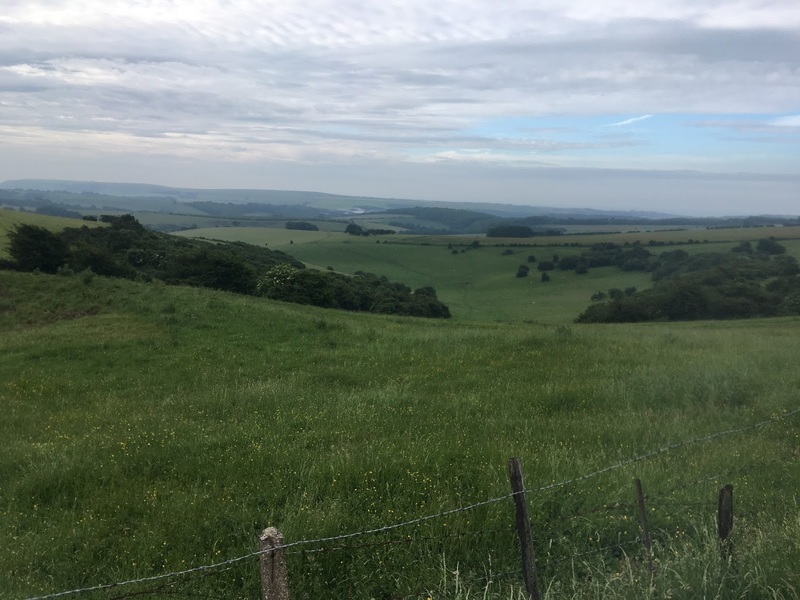 On Friday, 17th June all I could think about pretty much all day was that I was going to be on another overnight London to Brighton ride. There have been a few of these this year but the Brighton run is particularly good and one I like a great deal. The weather forecast seemed to changed several time throughout the week and as many times during Friday, so it was anyones guess what it would decide to do. From about 22:00 the heavens opened and there was much thunder and lightening. An hour later it was still hammering down and I wondered if it was going to stop at all? At about 23:00 I set off with waterproof over trousers as well as my jacket into a torrential downpour. The traffic was horrendous and my progress for a four and a half mile journey was painfully slow. Cars negotiated huge puddles and areas where drains could not cope and I didn't seem to be getting anywhere fast. When I reached the Marble Arch side of Hyde Park it was 23:45. I had missed the ride briefing and I genuinely thought I might miss the ride altogether as it would depart at midnight. 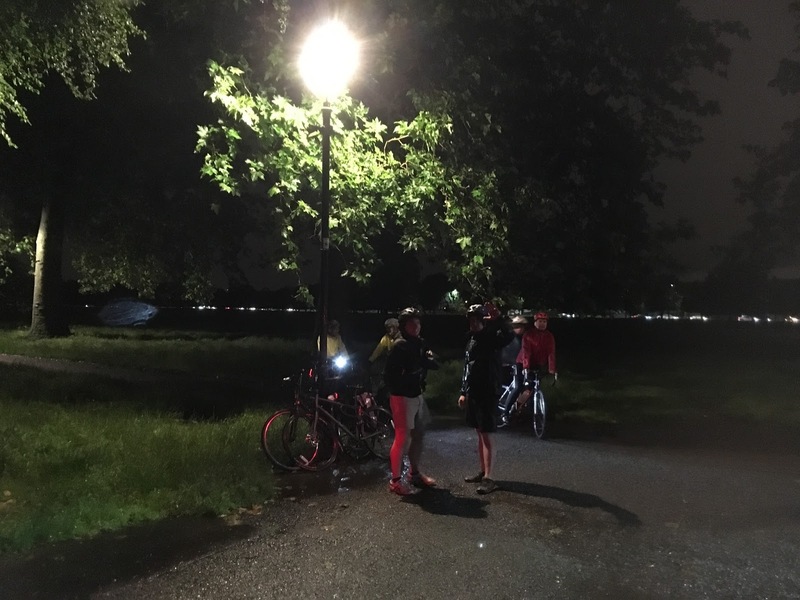 I cycled at speed through Hyde Park, possibly the fastest I have ever done and managed to reach Hyde Park Corner at about 11:52. Thankfully everyone was still there and with my name ticked off on the list I could relax a little and say hello to Geoff and Dr John. Sadly David and Anne were unable to come. We set off with the rain still falling, albeit lighter than before. The familiar sound of shoes clicking into their pedals and gears moving through the cogs were good ones. I had taken my Titanium Orange Brompton but I was wishing I had taken my trusty P type at times. The rear brakes just didn't seem to be working as effectively as they could. I had fitted a new cable earlier in the week for this reason but they felt the same. I made a mental note to get someone to have a look at it. We stopped briefly at Clapham Common - I think - to regroup and I have to say that photo opportunities were few and far between. My iPhone was safely packed away in a waterproof case but taking photos proved difficult as you had to roll the cover back a little. The ride was a slightly tweaked one with some of the more familiar choices abandoned. I have to say it was a good one. I have no idea where I now describe but there was a little section where we just seemed to climb and climb. At the top turning to where we had come we could see the lights of Croydon and two large illuminated towers that someone in the know said was an Ikea Croydon. This used to be Croydon B Power Station. 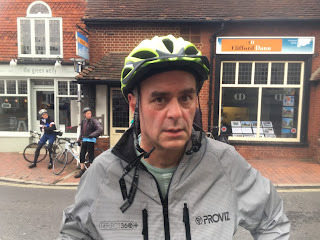 I was not happy with my rear brakes for the entire ride and at about 20 miles in Geoff's derailleur stopped working and about 10 miles later so did mine. Sadly it seems that a Brompton derailleur seems to do this after heavy rain where all sorts is splashed from wet road surfaces. Reaching Faygate by a completely different route at about 35ish miles we saw the familiar sight of 'The Cabin.' This served me a mug of tea, a thick cheese and pickle sandwich and a wedge of bread and butter pudding. I have to say I loved every bit of it. After about 40 minutes we departed and again I felt quite cold until a couple of minutes up the road - a very steep one - which is always the way on these rides. Every so often we stopped for the tail to catch up. For a very rainy ride there were surprisingly very few punctures. 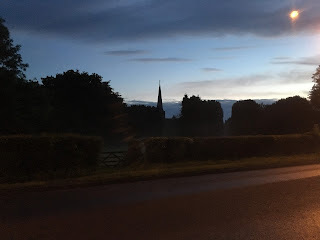 At about 04:45 the sun was trying to appear and a mist had descended. The strawberry moon - whatever this is - that we had been told we might see looked as if it made an appearance in the picture below with its reddish tint. 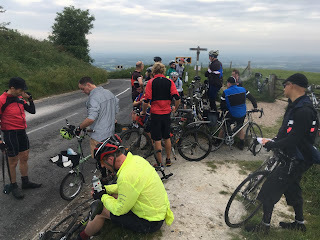 We stopped in a small village very close to Ditchling, with the sun risen and us trying to make ourselves ready for the dreaded Ditchling Beacon. With another stop in a field not too far fro the village some of us powdered our noses - perhaps to get ride of unwanted weight. I did this wearing bib shorts for the first time. 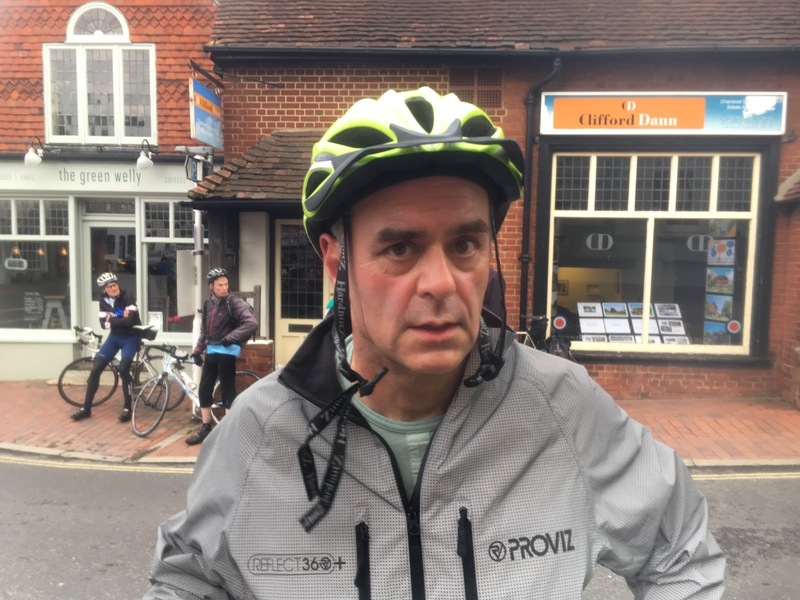 They are much more comfortable than ordinary cycling shorts but negotiating the powdering of ones nose does take a little practice wearing them! With the Beacon start in sight we made our ascent. Starting this ride I felt that my fitness was pretty low as it has not been a good year cycle wise and I just don't think I have put in the miles. I have to report that my ascent of the Beacon was possibly my best yet. 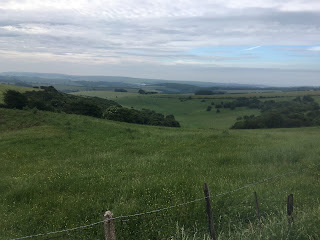 I love hills and I love the challenge of them. 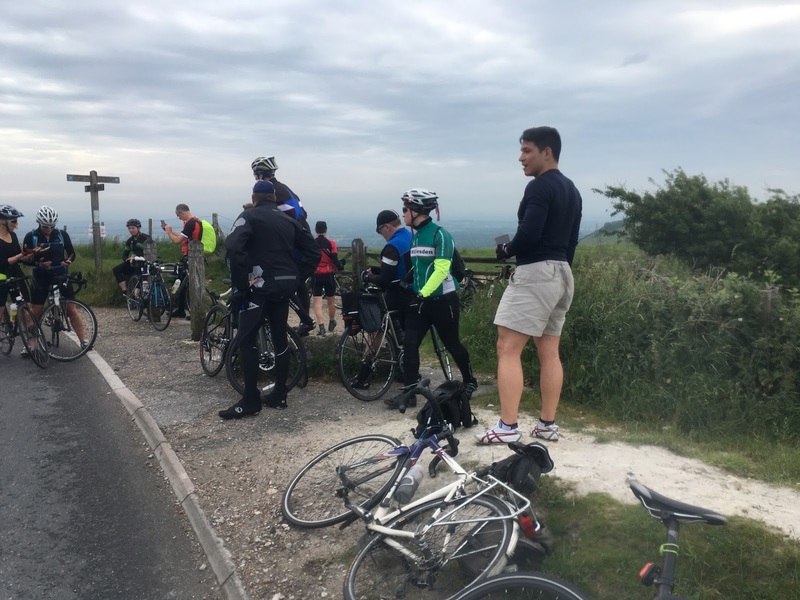 Perhaps seeking out hills at every opportunity while cycling has provided enough practice to tackle them well. The Beacon is hard but not as hard as the first time a few years ago. Geoff made his ascent not long after me and Dr John not long after him. We had done it. Ditchling Beacon conquered again. We stayed on top for a few minutes more in order to get our breath back, take in the views and cheer and give a round of applause to a few others on their arrival at the top. Along with a few others perhaps with the same thought we had - breakfast - we headed off into Brighton. 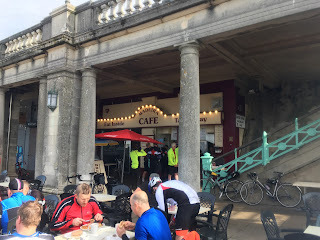 The ride from the Beacon to Brighton is almost all downhill and therefore of great fun. We made it down in good time and headed straight for the Madeira Cafe, the official end point for the ride. With a few goodbyes we headed off to an alternative establishment. 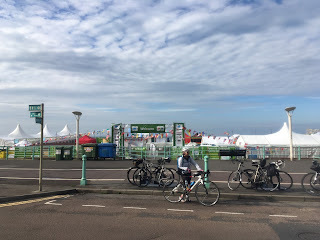 As we cycled back along the seafront, Brighton was getting ready for tomorrows London to Brighton bike event. I for one would much prefer the way we did it. After a good breakfast Geoff, Dr John and I headed for the railway station. To my horror I could see hundreds of exchange students waiting and surely boarding trains to London. In addition to this several trains had been delayed. Geoff could see that a train for London was sitting on platform 4 so we boarded it. It was packed but Geoff and Dr John got a seat while I kept a watchful eye on the bikes standing next to a luggage rack. At Gatwick and knowing there were no more stops apart from Victoria I sat in the opposite luggage rack and drifted off to sleep for about five minutes. 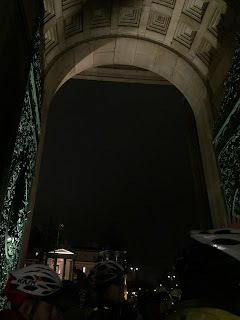 We arrived at Victoria and headed towards Hyde Park Corner where we said goodbye to Geoff. Dr John and I parted company just off the Edgware Road. This was a good ride and as will all Friday night rides to the coast I thoroughly enjoyed it. Many thanks to Adam for organising and to Geoff and Dr John for their company. I am not sure when the next ride for me is? 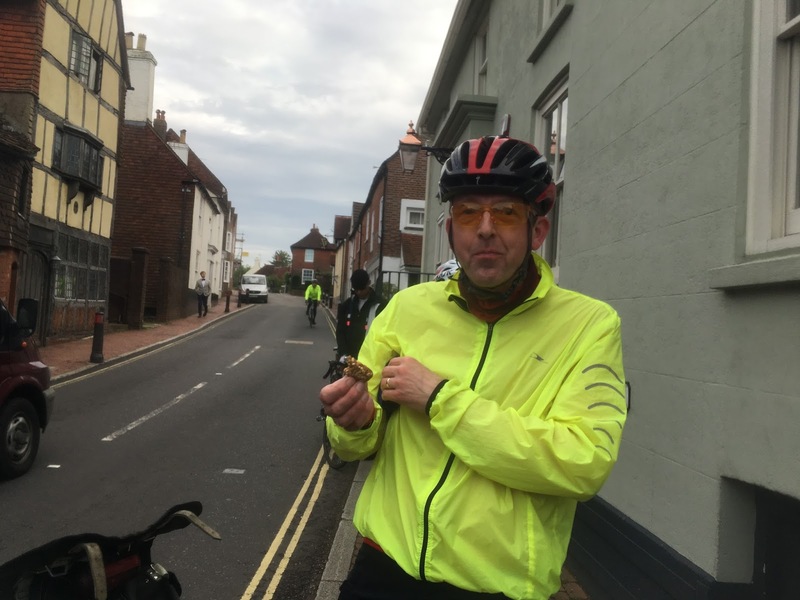 The Dunwich Dynamo is in about four weeks but I have to say I have talked myself out of it and won't be going. 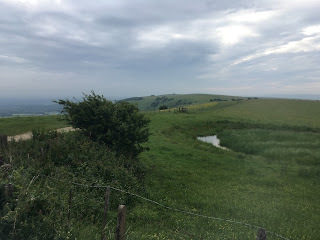 Despite feeling pretty good as I type this and the fact I coped well with Ditchling Beacon, I just don't think I've put in the miles this year. I was trying to explain to Dr John that my aim would be to arrive at Dunwich Beach by 07:30 or earlier and if I couldn't do that, I wouldn't want to roll in two hours later. There are a few other good options available that weekend though. I very much hope that the next time I do London to Brighton overnight I will do so on my big bike. I would love to see how this feels. There is of course a few more weeks to wait until I get my hands on it - perhaps another five. I cannot wait! Welcome back for now! So much enjoy the athmosphere your blogs are delivering. When it comes to the big bike i would guess you will enjoy a certain amount of anonymity? 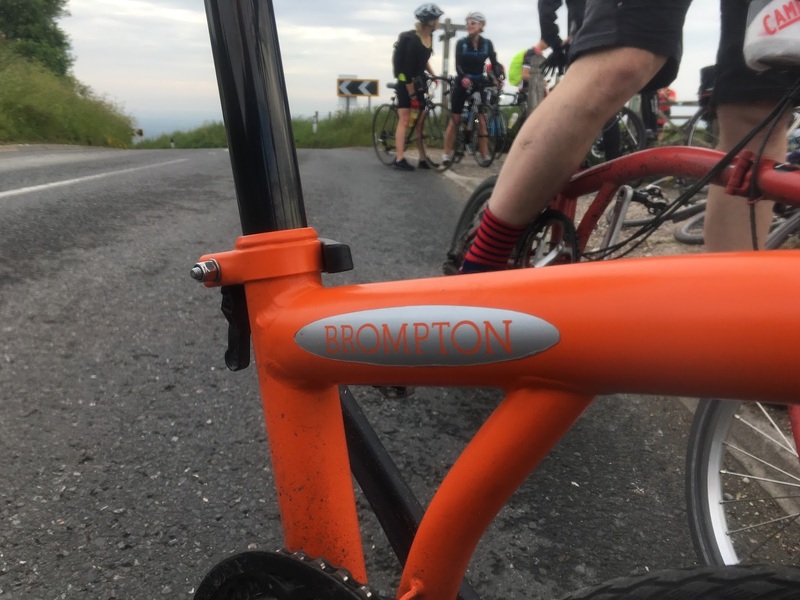 When it comes to speed and rolling difference compared to the Brompton is there, but it is really minute. Especially if you change the Marathons to Standard Brompton tyres. They are really good! 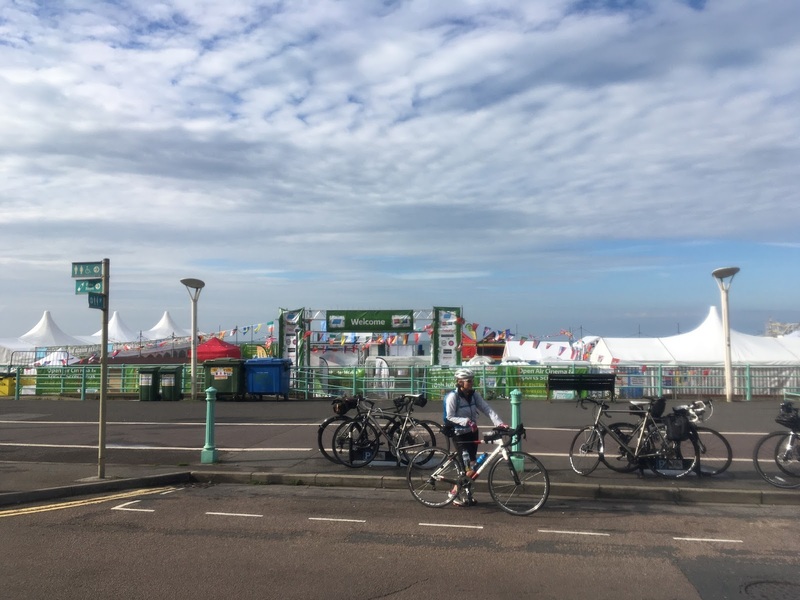 Brompton World Championships 2016 - Good Luck!